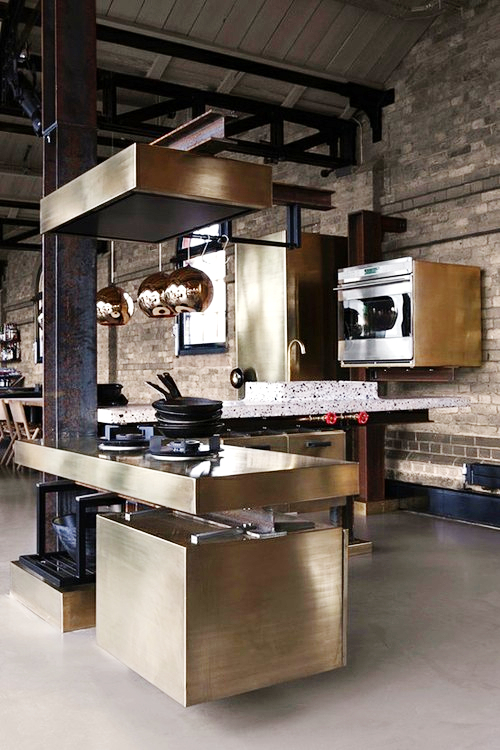 This could be the most fabulously dysfunctional kitchen design that I have laid eyes on in recent memory - what a great find from my tumblr feed! It's everything fabulous - the uber-serious moody overtones, the sense of haute kitchen fashion, the "this is my kitchen and did you notice the old iron lally column???" nuance. But, the best feature is the utter and ridiculous dysfunction. How does the antique brass countertop hold up? How do you clean this kitchen? What is the significance of 6 pans on top of one another on a gas burner? Where are the dishes and glasses, not to mention food, stored? If this set was not designed specifically to torture a professional kitchen designer, I'm not sure what other purpose it serves!